K-Tower at Tanjong Pagar - Amoy Street ~ They offer fresh seafood steamed within the tower. Each variety is laid beautifully to steam in each tier in the tower. 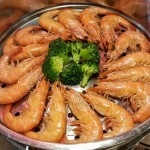 A great place for people who love steamed seafood. 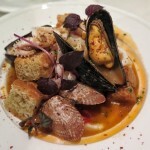 Ideal for friends and family gathering to enjoy the fresh seafood together. It is within walking distance from Tanjong Pagar/ Telok Ayer MRT. Founders of K-Tower were inspired by the “9 Layer Seafood” in their recent travels to Korea. 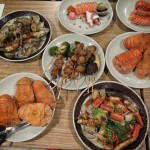 They brought the seafood tower craze in Korea to the shores of Singapore. I think ordering confinement meals is a great solution as this will save my family a lot of effort of cooking and cleaning for me. 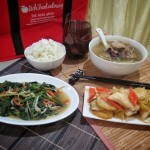 The confinement meals by RichFood Catering are delicious and nutritious. I especially enjoyed the herbal soups, steamed cod fish, Pork Ribs with Black Vinegar. Sweetest Moments offers full month packages, wedding packages, customised cakes and cupcakes (for birthdays, corporate events and other special occasions). 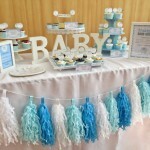 Sweetest Moments has won several Best Full Month Packages awards from renowned parenthood magazines. They have also earned many compliments from satisfied parents. 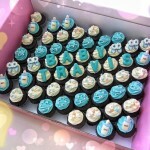 We love the customised mini cupcakes! They are so deliciously adorable and a huge hit among my guests especially the little kids. Jara Petit Cheesecups is our Singapore homegrown bakery which is specialised in baking cheesecakes. They are popular for their 'Cheesecups' which is a hybrid between a cheesecake and a cupcake. Their dessert table is a lovely set up. The cheesecups are like little cheesecakes wrapped around in the lovely cups. Great for Special Occasions like Full Month Celebration. HAPPY NEW YEAR 2017 to you and your loved ones! May your New Year be filled with happiness, warm, and cheer! Here is my first post for the year! Pool Grill ~ Located in Singapore Marriott Tang Plaza Hotel. Very accessible as it is located very near to Orchard MRT station and there is also a sheltered underpass to Marriot. With the Entertainer app (1 for 1 Main course deal), it is value for money. The dishes were delicious. The ambience was fantastic. 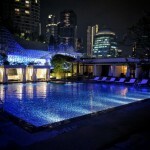 Love the night view beside the pool with ION Orchard as backdrop. Etna Italian Restaurant ~ Named after Italy’s most iconic volcano, ETNA offers an authentic Italian cuisine dining experience with their Mediterranean-influenced dishes to Singapore. They currently have 2 outlets (Duxton and East Coast) in Singapore. A cozy restaurant with lovely Italian designed artefacts. Great for friends or family gathering. 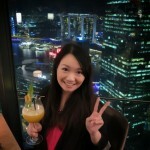 Artemis Grill ~ Located on the 40th floor of the city’s latest Green landmark CapitaGreen in Raffles Place. Offering a stunning Marina Bay cityscape, the restaurant also showcase the Mediterranean-inspired flavours with Fresh, Organic and Sustainable produce.